Advertiser.ie - Did Capt John Wilson ever receive his well earned plate? The PS Connaught under way, showing her modern hull lines, with straight-stemmed bow, and relatively small funnels (Photo from Tim Collin’s book). There can be no greater horror for passengers and crew than facing death on a burning ship in a heavy sea, that was sinking by its bow. Which death would you choose? Stay on board and be burnt? Or chance your luck in the waves? Such was the choice facing 591 people as the PS Connaught was clearly losing its battle to contain a fierce fire that was rapidly consuming the ship. The newly built Connaught, the flagship of the Galway Line, had compleated a trouble-free voyage from Galway to Boston, via St John’s, Newfoundland. It landed its passengers and mail safely, and on time. The ship’s elegance was the talk of Boston. Ten thousand people visited her, admiring her sleek build, her luxury fittings and accommodation, before she sailed on her return journey. 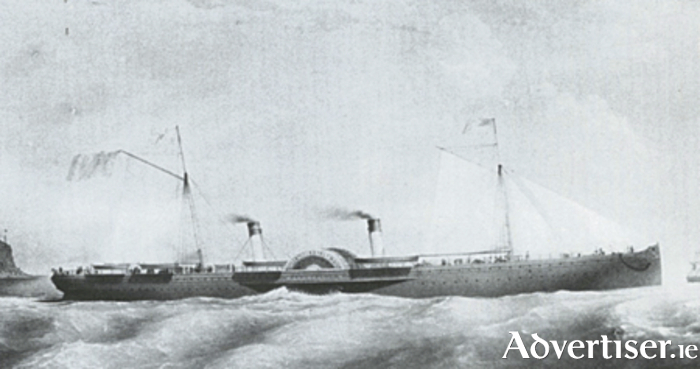 On October 8 1860, approximately 100 miles (160km ) from Boston, having safely survived a storm, a leak was discovered, threatening the main engine furnaces. When the auxiliary furnaces were lit they caught fire. Passengers were soon driven on deck by the smoke and flames. Despite fighting the fire for 12 hours, Captain Leitch, realising the situation was hopeless, gave the order to abandon ship. But once the small number of lifeboats, totally inadequate to take any substantial number of people, were lowered into the still heaving sea, many of them were smashed against the side of the ship. To add to this terror, eye-witness accounts said that the hulls became so hot they boiled the waves as they crashed over her. Just when all was thought lost, and despair among the passengers and crew must have been horrendous, a small brig, The Minnie Schiffer, and her gallant commander, Capt John Wilson, steamed rapidly towards them. The Minnie Schiffer had sailed from New Orleans to Marseilles, and was heading to Boston with a cargo of fruit and wine. Capt Wilson saw the Connaught’s flames in the growing darkness. Clearly he could not draw too close to the burning ship. He immediately ordered his life boat into the sea, and with what lifeboats could be saved from the Connaught, began to ferry the passengers and crew across to his ship. The last to leave the Connaught was Captain Leitch. The Minnie Schiffer could barely accommodate so many extra passengers. Everyone was crowded into the smallest space. Some had to hang from the rigging. But spirits must have been very high. The crew passed around fruit and wine. Tim Collins, in his book Transatlantic Triumph and Heroic failure - The Galway Line** writes that the Galway Vindicator (Saturday June 29 1861 ) reported that in grateful appreciation of his selfless conduct in rescuing the passengers and crew of the Connaught, the merchants of New York and Boston had prepared an elegant service of plate, duly inscribed, to be presented to Captain Wilson. In the same report it was also noted that Captain Wilson had joined the Confederate navy, to play his part, according to his beliefs, in the American Civil War which had just broken out. In consequence the presentation of the plate was deferred, and kept in safekeeping in Boston, where according to the Vindicator, it is awaiting Capt Wilson’s orders. I wonder if any reader knows if the wonderful Captain Wilson survived the war to collect his well deserved plate? Next week: The American Civil War and its effect on the Galway Line. * The New York Times was great for Irish news, no doubt because of its large Irish emigrant readership. On October 12 1884, it was the first to meet Tim Harrington MP, who had just returned from Maamtrasna, where he had investigated the witnesses’ testimony in the savage Joyce murders for which three men were hanged and five men imprisoned for life. Harrington proved that the Crown’s case was riddled with lies. * Published by the Collins Press, in 2002. The end of the Galway Line?